This is a larger, 3.8 oz size of Quenchy Cream. 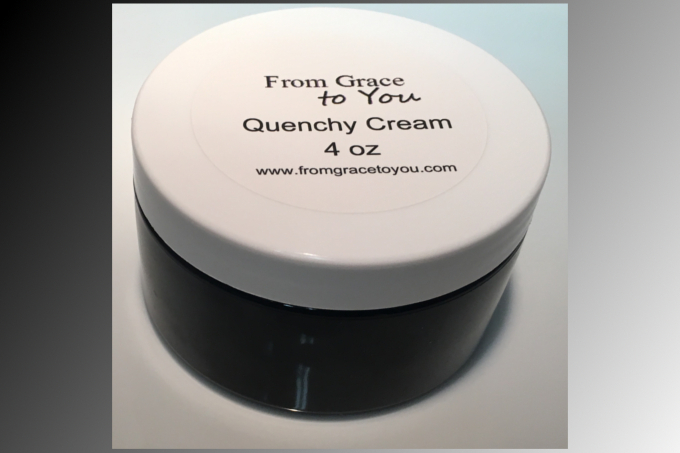 I'm told that not only is Quenchy Cream a fabulous skin moisturizing cream, but that it makes a very nice beard balm as well.Before I began my bath and body hobby, I used to buy factory made soaps and creams. I bought the expensive creams at the department stores and the factory made soaps at the grocery store. Every year in the winter, my hands would become so dry, they would crack and bleed. I thought I had dry skin. When I started making and using handmade soap, I no longer had that dry skin in the winter or anytime. Furthermore, when I first made and tried homemade cream, I was amazed at how much better it was than the expensive department store creams I used to buy. I'm not just telling you this to sell cream-as you can see I made a video below showing you how you can make your own cream at home if you wish. I have just come to believe that just like with food, bath and body products are better and cheaper if you make them yourself. However, if you don't have the time or don't wish to make your own, I offer the product for you to buy.Quenchy Cream is a wonderful moisturizer made with natural, wholesome ingredients.